For any marketer to fully develop personal relationships with consumers, they must avoid focusing on open rates, clickthroughs and opt-outs, and instead look at the bigger picture. While all three of these metrics are still widely used as indicators of success, tracking opt-outs is measuring the symptom, not the cause. Instead of fearing the unsubscribe button, marketers need to face the fact that if a user is thinking about opting out, they’ve already been lost. Simply tracking opt-outs bears no insights and adds no value – imagine if someone only tracked the number of times they were broken up with, and paid no attention to the reason why. Taking note of changes in user behavior patterns gives companies the ability to know when a customer is losing interest, or isn’t getting what they want out of a brand message. To enable this, data science is now widely used by leading marketing organizations and it’s changed the conversation from opt-outs to sustained opt-ins. By collecting the input that customers provide via their everyday brand engagements, marketers can create 360° user profiles based on real interactions. This holistic, user-level marketing approach turns brands into fully active participants in the ongoing customer-brand relationship and, most importantly, provides a statistically significant means of identifying behaviors shared by those who have previously opted-out. This enables the brand to then leverage predictive analytics to notice when there is deviation from normal activity at the user level, in real-time, at the point of interaction, not down the line when a user is already on the verge of opting out. Personalize content, and meet each customer’s specific wants and needs. Preempt disengagement automatically with active practices frequency adjustment and longitudinal studies. Predict a customer’s actions by analyzing previous customer behaviors and setting triggers. Prevent customers from opting out by sending messaging at the right cadence, with the right calls to action. Across our user base, we’ve seen a 5-20% decrease in opt-outs for companies that live, breathe and market by The 4 Ps Framework, and massive increases in conversion, frequency and lifetime value. Our clients are following the flow of each customer from their desktop, to their mobile, and into the store and then personalizing each and every person’s brand experience to maximize effectiveness and enjoyment, optimizing their lifetime value. 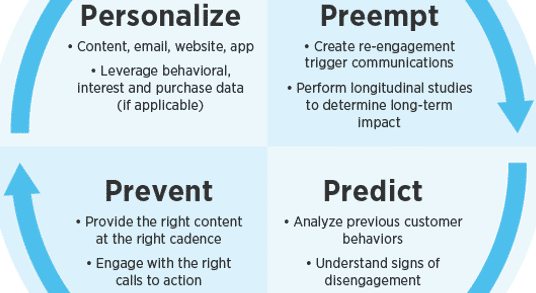 Here’s an example of how an ecommerce company would successfully deploy 4 Ps Framework: a brand collects behavioral, interest, device and purchase data through onsite, email, mobile and social channels. This data is used to create true 360° user profiles that drive 1:1 personalization in email and onsite messaging that it tailored not just to name and geography but also time of day preferences, brand affinities and more. If a customer is observed making one purchase of the same item annually, the brand moves from sending product-based emails to content-based emails. As response rate and other behaviors evolve (e.g. X page views means that user is likely to buy in the next 7 days) the brand automatically knows when to alter content and shift back to product-based emails in order to preempt user wants and needs based on triggers developed against and tested with their other users. If engagement and other metrics begin to change, the brand can predict if the customer is on the path to another purchase or moving towards disengagement. Based on specific criteria the brand then knows to automatically serve specific re-engagement calls to action across all channels as, for example, only 20% of users might open any given email. By delivering re-engagement CTAs, the brand can then prevent the opt-out before the customer is even thinking about it. When customers enter into a relationship with a brand, they do so with expectations of the experience. Because customers are now “always on,” thanks to their smartphones and tablets, there’s a rising expectation that companies will know exactly what they want, when, and how – and they’re not wrong. By paying attention to the first-party data at your fingertips, it’s easier than ever before to know each purchaser on a personal level and to engage on their terms. The bottom line is that in today’s world brands need to be customer obsessed. Consumer trust and rapport is even more so vital in the online era. Companies that excel in engaging customers on multiple platforms can expect to retain about twice as many customers as those who don’t. Given that 80% of revenue comes from 20% of customers, increasing the quality and lifetime of your relationship with existing customers is key to ensuring that your most valued clients are not on the path to opting-out.